A delicious Mexican condiment, great with rice and beans! Few simple recipes just touch your heart and above all your taste palate. 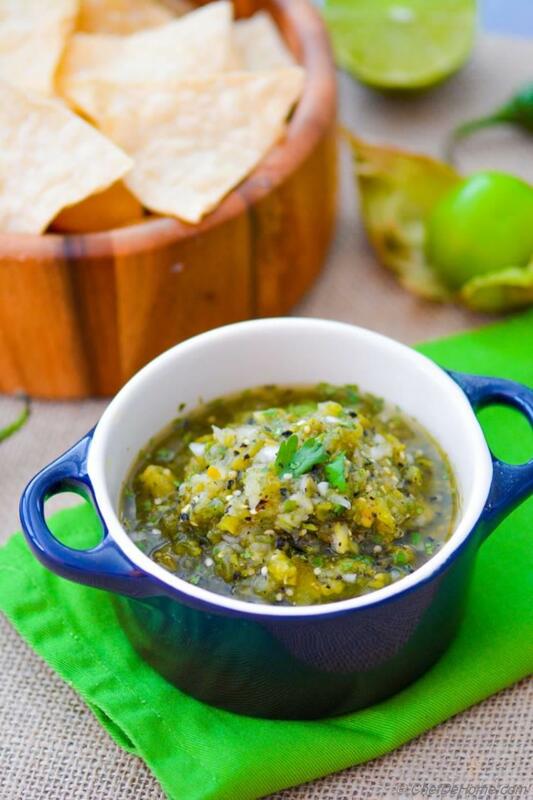 Tomatillo Salsa is one of such simple yet very flavorful Mexican condiment that I can never get enough. My first introduction to roasted salsa was in Chiptole's Mexican Grill, while eating a vegan bean and rice bowl. Back then, chipotle had very less vegetarian options, but many times, I just loved this rice-and-beans-bowl with scoop of fresh salsa and roasted, medium spicy Tomatillo Salsa. Similar to this dish, Indians have very famous dish called "Rajma Chawal - Curried Red Kidney Beans and Rice", loved and eaten all over India. Young or old, no one will ever refuse to eat this dish. My rice and beans bowl at chipotle often reminds me of that. 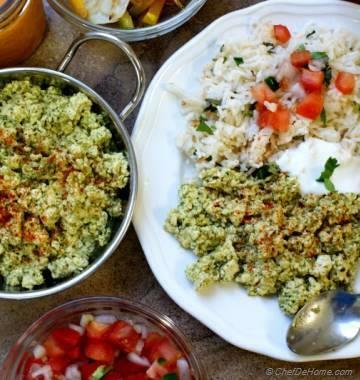 This dish in India is often served with plain yogurt and some fresh onion-tomato salad on the side. That is pretty much like a dollop of Mexican creama and fresh salsa in Mexican cuisine. Isn't it amazing? Two countries, so far apart and still such a close resemblance of flavors! 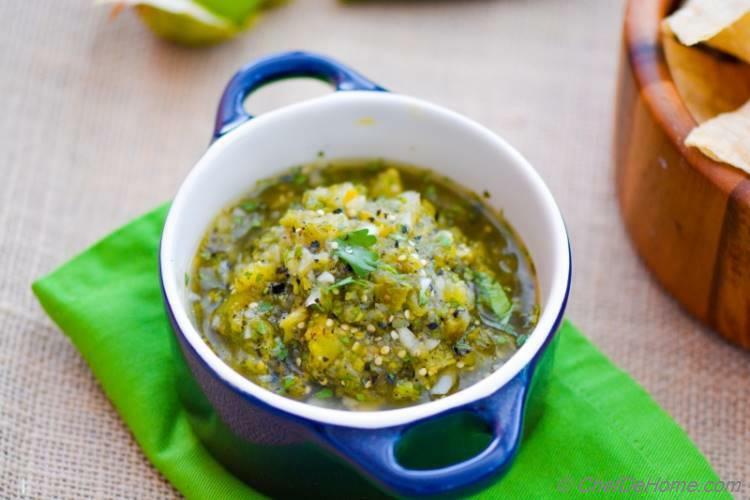 One thing that Indian dish don't have, is Roasted Tomatillo Salsa! I loved this salsa so much that probably, I will not eat rice and beans without salsa EVER again!! Since I started working on this blog, many of my take-out favorites are made-at-home and chipotle's food is on top list! You all know my love for everything Chipotle! So... today's recipe is another attempt to bring chipotle's famous - roasted salsa, to your home. It is a very simple recipe but flavors are excellent. Charred bits of tomato skin with zesty jalapeno, lime, natural sweetness of chunky onions and tomatillo, some seasoning, and that's pretty much it. 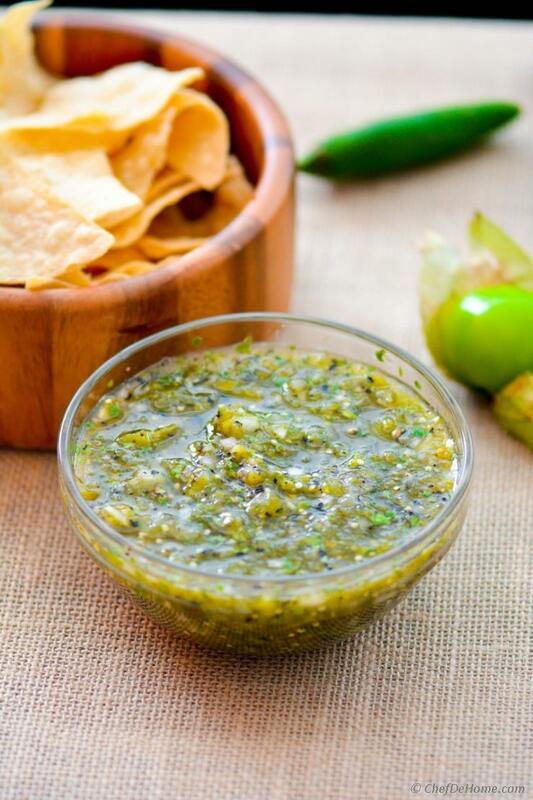 These simple ingredients do magic and make salsa pop in your mouth. For me, it makes every bite of rice-beans fresh and inviting! Remember!! when ingredients are simple, technique of cooking gives that extra kick! AND that's why I have to share this recipe with you. Otherwise, I bet if you tried Chipotle's salsa, you already knew it had these ingredients! no secrets here! right? 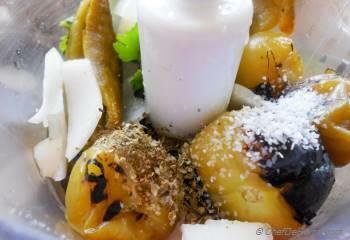 Roasting tomatoes or for that matter any vegetables brings out the natural sweetness and also enhances the flavors. But, here we are talking about fire-roasted, that charred out-side, almost like grilled tomatoes (and grilled jalapenos too!). 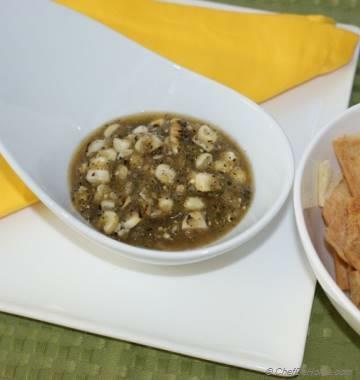 You will be surprised to know that this salsa is cooked further, in vegetable broth to enhance the flavors of tomatillo. You can skip the cooking-in-broth step, but I strongly recommend you try. I promised to give you all recipes of chipotle. So that you can enjoy a great Mexican meal at home, under budget! This post also goes towards keeping that promise. Check out All Chipotle to see all details and list of recipes already online. Smart Swap Can't find green tomatillos? You can also make this salsa with ripe red roma tomatoes. 1. Fire-Roasted Tomatillo Salsa - Roast tomatillo, and jalapeno on open flame, indoors or on grill until skin is nicely charred. 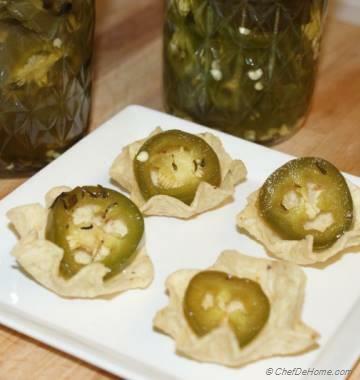 (about 5-6 minutes).Once done roasting, remove skin and seeds from jalapeno, leave tomatillo as-is. 2. In a medium sauce-pan, heat vegetable stock, add cleaned jalapeno and tomatillo. 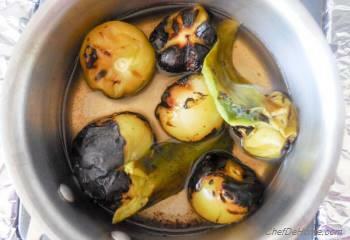 Cook until water has all evaporated and tomatillo are tender and pale yellow in color. 3. Transfer all contents to food processor with lime juice, salt, pepper, chopped white onion, cilantro, and oregano. 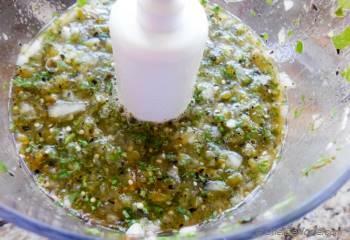 I prefer food processor over hand-blender for this salsa since we are looking for little chunky bits. 4. Pulse the processor (just 4-5 times) to chop salsa. It should still have some chunky bits of onion and tomatillo. 5. Viola!! 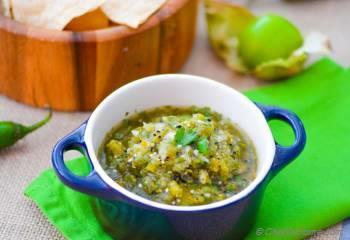 Roasted Tomatillo Salsa is ready!! Did I mention? 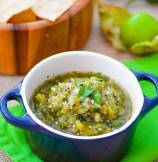 Roasted Tomatillo Salsa is Paleo too! Great for a Paleo get-together! thank you so much, Anupama! @Danna Harris, thank you so much! I love your all chipotle recipes Savita. This one looks so vibrant and yummmm can't wait to try!